This vegetable noodle miso soup will brighten up a winter's day! Healthy & healing, it's made with lemon, ginger, and turmeric. In December, testing cookie recipes every day was a bit of a sugar rush. 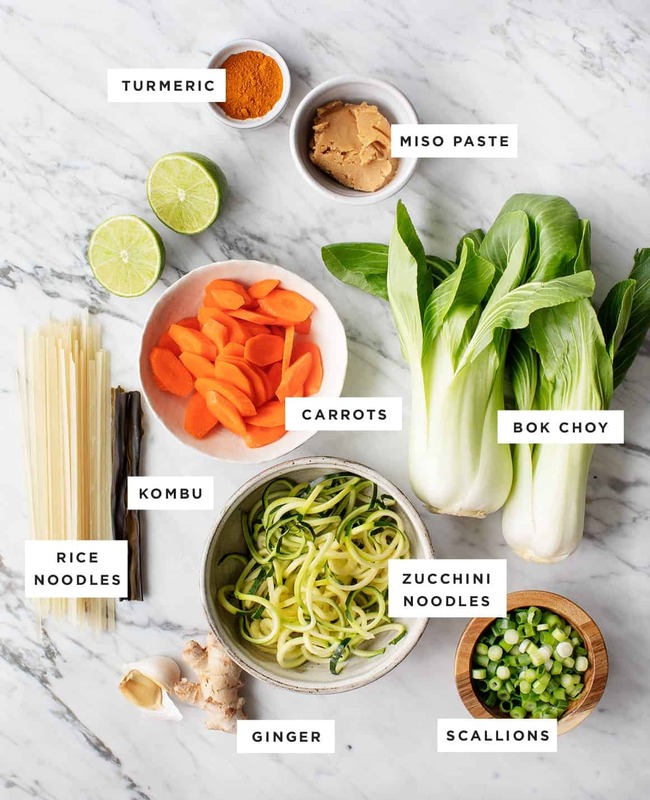 After that, balance was restored while testing/creating this healthy nourishing veggie noodle miso soup recipe. 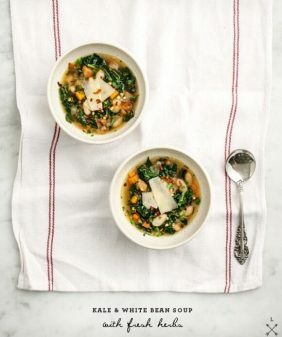 I think I ate this soup four times in a row last week – so what you’re looking at is my unintentional soup cleanse. Now, I don’t “cleanse” for health purposes, but I did really enjoy eating this soup over and over again :). 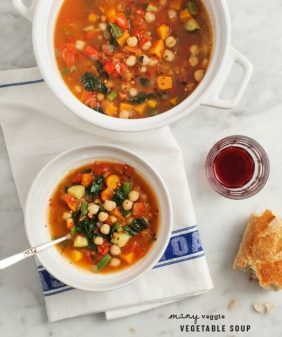 This soup is bright in color and in flavor. If you’re trying to eat lighter in the new year – but still want to eat something delicious – give this soup a try! Its brothy base is a simple dashi stock, the nourishing base of many soups in Japanese cooking. 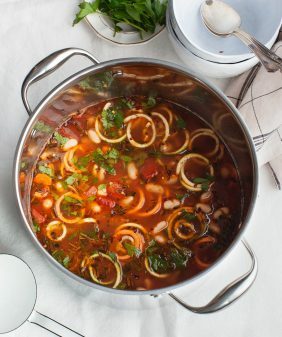 If you’ve been reading the blog for a while, you may recognize it from this gingery soup. Make the dashi by gentling simmering kombu in water. Then, whisk in the miso paste to thicken the broth and give it much of its flavor (don’t skip it here!). Be careful to keep your soup at a low simmer after the miso is added, as high heat can destroy the healthy enzymes in miso. I round this soup out with scallions, ginger, turmeric, carrots, and bok choy, and I add tofu for extra protein. Instead of filling the soup with lots and lots of noodles, I used half rice noodles and half zucchini noodles. This way, you still get that satisfying feeling that comes with eating a bowl of noodles. The soup is finished with a pop of lemon & lime and a bit of sriracha. It’s like a healthy veggie hot and sour soup. It’s a little punchy, a little earthy, and a little spicy. I hope you enjoy! 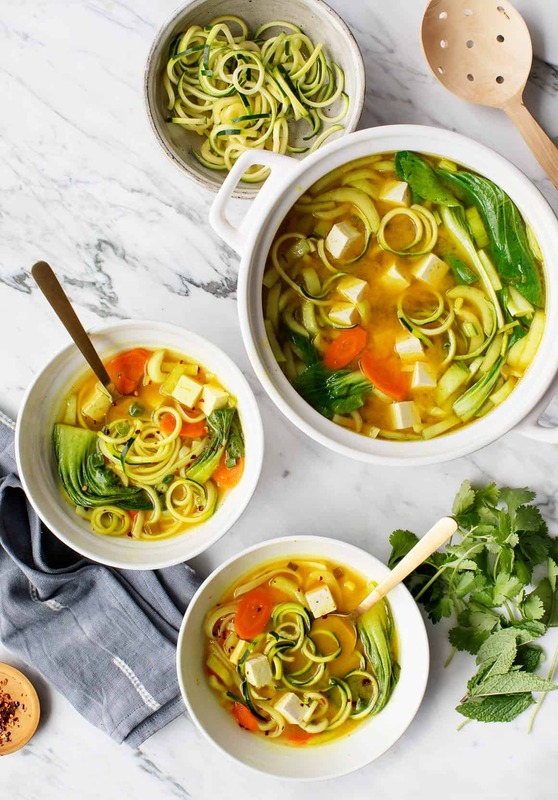 This vegetable noodle miso soup will brighten up a winter's day! 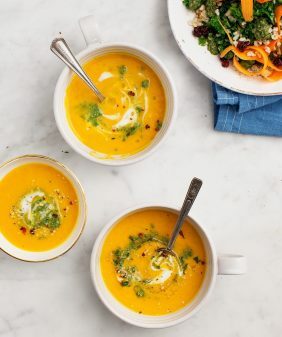 It's a healthy, healing soup made with lemon, ginger, and turmeric. In a medium pot, combine the water and the kombu. Simmer gently, without boiling, for 10 minutes. Remove the kombu. Add the scallions, carrots, ginger, and garlic and simmer until the carrots are soft, about 20 minutes. Scoop ½ cup of the hot broth into a small bowl with the miso paste. Stir until combined and return it to the soup pot. Add the turmeric, black pepper, lemon and lime juice, coconut oil, tamari, sriracha, tofu, noodles, and bok choy. Simmer for 10 minutes. Season to taste with ¼ teaspoon sea salt, if desired, and serve with fresh herbs, if desired. Have not tried recipe yet , but it seems to be very interesting . Will try soon . Like something I would enjoy . i would have posted earlier but we counln’t make ourselves take a break from eating this. this is so, so delicious. i’m more of a fan of sambal olek and substituted that for sriracha. and since we didn’t have bok hoy, i used the dino kale instead that needed eating. thank you for a wonderful tasting and looking and smelling recipe. Hi Tanuki, I hope you love the soup! Prepared this tonight as a post yoga dinner. Added Shiitakes and snap peas. Omitted the tofu. Just perfectly balanced. Thank you. Hi Gil, I’m so glad you loved it! My boyfriend loves miso soup so I definitely want to make this for him to see if he likes it. 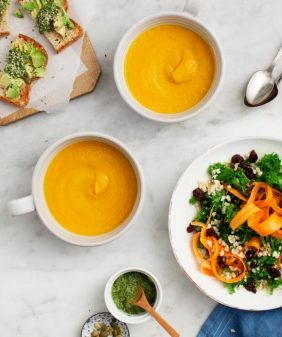 I had one too many Christmas cookies myself and turned to lots of nourishing soups and salads to get a break from the sugar! 😉 I love how you used rice noodles and zucchini noodles here, such a great combination! This looks so yummy! The perfect ingredients for a post workout meal! I am definitely trying this at home! I feel like adding some jalapenos to this recipe would be a nice extra kick! I definitely want to give this recipe a try now, thank you! This looks delicious and sounds healing. I managed to catch a nasty virus and this sounds like it could nurse me back to good health. So zingy and tasty! Thank you! Perfect for a cold, snowy day! Love the way this looks. Amazing pictures! Can’t wait to make this at home. 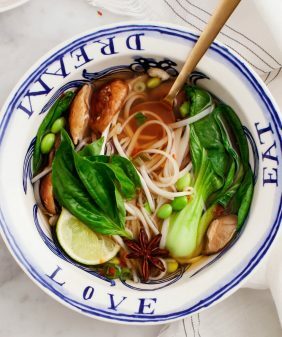 Miso is one of my favorite ingredients by far! Hey, I want to make this tonight, but I was wondering. Did you use 2.5 ounces rice noodles AND a zucchini, or did you use 1 oz noodles and a zucchini? Thanks! I used both here – the 2.5 ounce noodles and the small zucchini. I suggest that amount if you’re serving this as a main for dinner. If you use less, it yields lighter, more broth-y servings. Hope that helps! Absolutely loved this recipe. Very easy to execute, but has a complex, spiced broth. Amazing! This is super delicious and reheats well (every day for three days after, in my case). We LOVED it! One spice sensitive kid did find it heat hot even though I reduced the siracha a little. I might recommend omitting from the big batch a using for personal bowls if you have anyone who doesn’t like mildly spicy.